Those were just some of the words that came to mind as I watched the live feed of the 118th running of the Boston Marathon. It was the second year that I hunkered down in my makeshift control tower, following runner tracking, watching, mesmerized, as the elites tore down course records in breakneck speed; holding my breath with every course turn, biting my nails as camera angles changed, and dashing for quick restroom breaks, as if I was running myself, so I wouldn’t miss a single moment. Of course, last year, the energy was stolen from the running community, and many wondered if things would ever be the same. And as many predicted, it wasn’t. With every runner, from the last ones leaving the corrals in Hopkinton, to the incredible Meb Keflezighi, crossing the finish line as the first American to win the race since 1983, this year’s Marathon Monday in Boston was one to remember. Even 1,500 miles away, on my computer in Sarasota, FL, I felt like I was part of the action, and was inspired by every moment. I know that I have a ways to go to reach my goal, one that I set out to accomplish back in 2012 – to qualify for the Boston Marathon. I didn’t make it then, and in the few attempts I’ve made, I’ve chosen to fuel myself with the possibility, rather than the burn of defeat, to keep pushing harder. My original goal was 2013. I didn’t know what it took back then, and in each marathon, I’ve learned something more about myself. About running. About what it takes to accomplish the seemingly impossible. I watched today, and read tweets that ran the gamut – from gleeful goal-crushing, to physically exhausted missed goals, or even tearful decisions to withdrawal from the race. I saw the deep burn of disappointment in Shalane Flanagan’s post-race interview, but you know what? 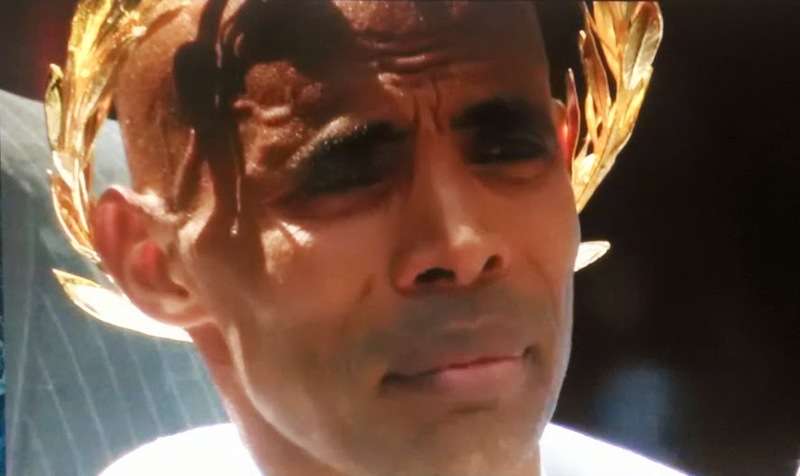 I also cried those tears that fell from Meb’s eyes as the Star Spangled Banner was played, honoring his incredible accomplishment, and smiled as I watched the live camera of the finishing line. I have to admit, I became completely swept up in the mania of today, and wondered, albeit briefly, if there was a feasible way that I could get to Boston even sooner than 2016. Fortunately, it was but a momentary thought. I’ll be training to the strongest of my ability this summer, for my 10th (!! still cannot believe it !!) marathon: Chicago. With a sub-3:35, I’ll qualify for the 2016 running – the 120th Boston Marathon. This summer, I will focus on perseverance. Strength. Resilience. Pushing past expectations and boundaries…and trust. Trust in my abilities, my resolve…myself. What did you learn from the 2014 Boston Marathon? Have a favorite moment? Runner? Tweet? Krissy, I know your love of running, your dedication to training, your ability to reach ever loftier goals, and your love of life will get you there! Only something totally outside your ability to control has a chance of slowing you down, and not even a good chance! Your disciplined training schedule and fast paced running leave me in awe! Let me be the first to congratulate you now on BQing in Chicago – because I know you’ll do it. Not because it’s easy, but because I know you’ll make it happen. Good luck with your quest to BQ! I know you can do it! Krissy, I know you’re going to get your BQ. Yesterday was great motivation for it. I wrote an entire post too about what I learned from the race, and specifically, Meb. His was an inspired and inspiring run! Ahh I loved virtual spectating too! It was so exciting. I hope to be there in 2016 as well! 🙂 I hope we are both there! !